Click the button below to add the Effect Pedal Case ID 28x14x6 - 3/8" Ply - FACTORY CLOSEOUT! to your wish list. The inside dimensions of this case wall to wall are 28" x 14" x 6" high. 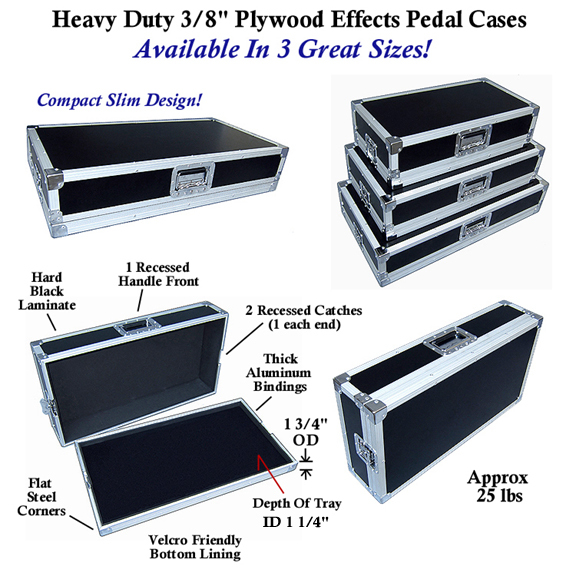 The pedal case ID 28x14x6 with 3/8” ply case is constructed of high quality plywood with a hard plastic black laminate on the outside and a carpet lined (Velcro friendly) inside base. It has a generous roll of Velcro included for conveniently attaching pedals. All the catches and handle are spring loaded and are recessed into the case for strength and shear resistance. The lid comes off and used as a pedal board, so there is no need for a secondary board inside the case. We have a limited supply, so please hurry. We’re looking forward to making your aspirations a reality! Solidly built, sturdy and functional. Delivery surprisingly quick, and received great communication from sellers. When the need arises again, Road Cases USA will be my first (and likely only) stop. I purchased this road case to use for a light board that was quite large. I added some foam and mounting strips on the taller part of the case. Works perfect looks great! Very pleased with this purchase. I use it as a carrying case for my 28" x 12" pedal board. Perfect size & enough overhead room for all my associated cables. Needed a decent road case for my pedal board and pedals etc. I gotta say I was holding my breath a bit waiting for this case arrive. Now that it's here and loaded up with equipment I'm totally blown away by this case it's built like a tank it looks great and it already past the first test (dropped it down the last 4 steps at a gig. A couple if scratches and dings but everything inside was untouched and in disturbed. This won't be the last case I buy. 1. Built very solid. ATA style to the max. 2. serves dual purpose of pedal board and case in excellent fashion. 3. Price is way below what a case like this normally goes for. 5. Felt-like material on floor of pedal board serves as a very solid cushion and sticks to velcro quite well. 6. For it's level of ruggedness, it has a very reasonable weight to it. This case is for my pedal train rack. It is well built, a road warrior, and definitely the protection I need for my stomp boxes. Excellent price, high quality! This is the second case I've purchased from RoadCaseUSA. The first was for my Presonus 16.4.2 and that case was exceptionally constructed. Customer service was great ... very happy with the mixer case. NOW ... for the Pedal Board Case: I purchased it as a closeout ... expecting equal results (perhaps naïve on my part). However ... as much as I love this company ... this case has two issues: 1) The interior foam AND carpet was not glued in as well as expected. The interior foam trim around the inside edge of the lower base is crooked all the way around. Looks like someone rushed through gluing it in and didn't take the time to make sure it was aligned. 2) Make sure spend the extra money to get the 4 latches instead of the 2 end latches for keeping the lid attached to the bottom. Even though my case is only 28" long ... the long edges do not align straight across where they connect. There is definitely a warp along those edges and if they had the 4 latches along the long edges instead of the 2 end latches ... I KNOW that would secure the long edges perfectly and keep them from bowing. When I spoke to customer service today ... I was reminded that it was a closeout and I couldn't return it for the better model without a large restocking fee ... and was ALSO assured that they hadn't had any complaints about the 2-latch system and that I shouldn't be concerned ... especially not on a 28" wide case verses something perhaps 40" or longer. I guess "SHOULDN'T BE A PROBLEM" trumps "TRUTH" by their standards. You would think that when someone was willing to upgrade to a better, more expensive model ... they would consider my dis-satisfaction and allow me to return a "not-so-perfect" product for a better one. Oh well ... I guess I'm stuck with a flawed unit and shouldn't expect perfection from a close-out unit. Buyer beware of the NO-RETRURN policy ... they mean it! Solid, construction, nice corners, recessed handle and latches. Large roll of fastener material was a bonus. Would highly recommend . Nice case. It's very well built, strong and sturdy. When I ordered this case I was really hoping for something well built, clean, sturdy and light weight and that's exactly what I got. This case is very well built and light weight. It has a thin layer of dense padding to build from and on the bottom inside face it has a felt lining to velcro to. It also came with a big roll of wide sticky back velcro for effects. I will be buying more from these guys! This company is now my go-to for cases. My Axe FX MFC 101 Mark III now has an inner sanctum in which to dwelleth and be at peace. Amen. My pedal case arrived right on time. I haven't had a chance to arrange things yet. But, the case seems very sturdy and came with a huge roll of velcro, which will make things much easier. If this is typical of their service, I would not hesitate to buy from Road Cases USA again. Great case. Strong, sturdy, heavy duty, built to last. Perfect size. All around a very good case. So far, so good. I was thinking I would have to order a custom case until I stumbled across this website and found the perfect size for my setup. This thing is nice and sturdy. I also like the recessed handle and latches. Seems like a minor detail, but if you've ever had a latch get caught on another piece of gear in the back of a van or trailer, you know how nice it is to have recessed instead. Overall, this is a really nice pedal board case, especially for the price. My case arrived quickly and free of damage. My pedal board was already made per the dimensions specified for the inside space of the case, so I was happy that the case was made to the proper dimensions, it fit great. Some velcro was supplied with the case, which I did not expect, however the velcro was not as strong as the stuff I already had (not complaining about the free velcro though!). I would reccomend buying one of these..look around and compare prices & recessed hardware, you be back here for your purchase. awesome pedal case for the price, plenty of velcro to attach pedals, great buy! Solid and great looking case! I purchased this case to replace my homemade wood case for all my pedals. Im heading out on a nice tour with a great band and needed something more pro. This worked perfect. came with a huge amount of velcro for pedal installation. 3/8 was good width too, nice and solid. Only downside that i noticed is that there are no groves or holes that come out of side of board. Ex, my wah is first in chain, when i want to plug a cable into it, the lip of the board is kinda in the way. but not a problem, i just installed a small thin board just to elevate my wah, now the cable fits perfect. Just love my new pedal board, very well made, and 2X what I could have gotten at a retail store for what I spent! Highly recommended, I'll be using this one for a very long time! They even included a roll of VELCRO with it! I do like the case a lot, very sturdy, and minimalistic! It is also quite large but the recessed latches do a great job keeping everything locked up and professional looking. It's also on the heavy side but I like to think of it as added security. Pedalboard with strength, room and road ready! Bought this as a "refurbished" and asked for a few extra pieces of Velcro. Case arrived well packed. I looked it all over looking for signs of "refurb", but....none! This case is rock solid and fits my Boss GT6B, a Boss dual pedal looper pedal, both power supplies, and leaves more than ample room for a few instrument cables, a six outlet extension cord, and even my manuals! Great price, great product, great service and great communication with great sales folks! I'll be back for ALL of my road case requirements! I got the 28 x 14 x 6 pedal board case, and it's a great value and really nice case. It's well made and durable. It fits all my pedals nicely . I really like it, and with all the hardware on it the 3/8" ply is just right, if not just a tad too heavy. But other than that, I expect it to last a long time.